It is the first week of January, 2015. Did you make any resolutions? Here’s why I believe you should. 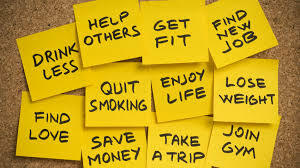 Making resolutions forces you to reflect on your life and think about the one thing you should improve moving forward. If you consider how you conduct your life to be perfect, then you aren’t evolving. Staying even in a dynamic world is the same thing as sliding backwards. A resolution should be meaningful. A trite resolution, such as, “I will not eat Cheetos” is a non-resolution, because you can easily eat Doritos and accomplish nothing in the process. Make a resolution that makes a difference. Any resolution or goal should be measurable. For example, if your goal is to raise your income in a commission job, you should know your metrics. What is the average sale value? How many cold calls to make a sale? How many leads should you pursue per day/week/month? If your goal is to lose twenty-four pounds in the year (for noble reasons such as reducing your blood pressure) then you need to lose two pounds per month, or one-half pound per week. You can’t starve yourself and lose twenty-four pounds in the month of December. Inspect what you expect. Reward yourself for attaining goals and resolutions. You deserve it. But close the loop at the end of the goal cycle as to why or why not you didn’t honor your resolution. Continuous improvement is self-awareness. Dating for Life is also about continuous improvement. Continually ask yourself how you can better interact with people and you’ll be amazed at how your relationships with family, friends, colleagues, or even the love of your life will evolve for the better.